What if you and your spouse spent years saving and planning for THE trip of a lifetime which involved taking the kids to travel through Europe for a year and during that year long trip, THE STOCK MARKET CRASHED and you LOST ALL YOUR MONEY? This isn’t hypothetical. This is what happened to the Millers, A Family of 6 from the U.S. and Canada. I bet the last thing you would do is travel the world with your kids after this catastrophic loss right? Not the Millers. Find out how the Millers used this terrifying experience as a Catalyst to create an extraordinary lifestyle, travelling and experiencing the world together as a family for almost five years straight. Number Of Kids: 4 kids (16- Hannah, 14- Gabriel, 12- Elisha, 10- Ezra) this was back in 2012. Europe:—> UK, Netherlands, Belgium, Germany, Czech Republic, Austria, Italy, France. Asia:—> Thailand, Vietnam, Cambodia, Laos (so far!). Finances: Online workshops to help would-be travellers, kindle ebooks, Freelance clients: Filemaker database developer designer, freelance writing. Since 2008, the Millers have travelled to over 20 countries and counting: including almost one year of cycling over 9,000 KM through parts of Europe. They have visited almost every state in the US, almost every Province in Canada, and all but four states in Mexico. They visited temples in Asia, rode elephants and camels and they did this with 4 kids in tow who were all under the age of 12 when they started their adventure. The Millers are what you would call long term travellers because they travel for long periods. They are also known as slow travellers. Slow travellers can spend up to a few months in one spot before moving on to their next destination. To date, they’re longest stint in one place has been 3 months in Tunisia and 6 months in Guatemala. You might think that the Millers did a lot of pre-planning for this whirlwind 5 year adventure but they didn’t. It was by some pretty horrific and financially traumatic circumstances that they ended up travelling the way they do. In 2006, Tony and Jenn Miller started planning what would be a one year family gap year. Not just any family gap year. A cycling gap year which involved cycling over 9,000 Kilometers across Europe to places like the UK, Netherlands, Belgium, Germany, Czech Republic …….with their 4 kids who were between the ages of 6 and 12 at the time. By 2008, after two years of very careful budgeting and planning, they were finally ready to start moving slowly through Europe. They had sold their house. Sold or gave away most of their stuff and put what little precious things they wanted to keep in a little 8 x 10 storage unit somewhere in the U.S. They also did a bunch of other logistical things for their trip. They really thought they had it all figured out but the Millers didn’t plan for everything. To be fair, they couldn’t have planned for what was about to happen. Around the end of 2007 , jobs were slowly disappearing. The economy was about to take a dive. People would have a hard time finding jobs and the unemployment rate would reach record highs. No one, including the Miller’s knew this was happening YET. As far as the Millers were concerned, all was good and going as planned. They left for their trip and then one day during their trip, in October of 2008, the stock market crashed and with the exception of a few thousand dollars in various checking accounts and their retirement funds, they lost all the money they had saved up and were supposed to live off of during the trip. They lost all of their money. Most people would be devastated by this but a funny thing happens to some people. They either shrivel up defeated or it brings out this internal tiger that wants to beat the odds and make you fight. The Millers didn’t run back to the United States to lick their wounds and try to rebuild their old lives. Instead they settled in Tunisia for the winter to regroup. 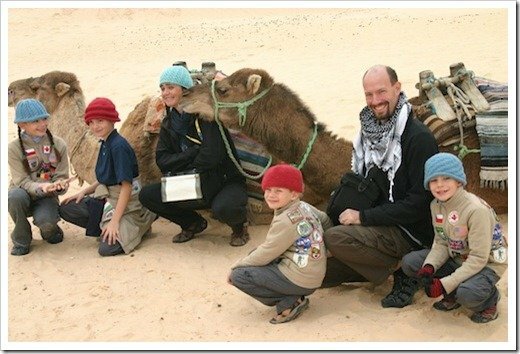 They knew they didn’t want their adventure to end but they needed money to continue so they used their time in Tunisia to figure out how to make some money far for their adventures and beyond their one year gap year that has allowed them to travel the world with kids in tow. MONEY How Much Do They Spend? You might be surprised to learn that it costs the Millers less than $36,000 per year to travel the world with kids as they do. That breaks down to about $100 a day, $3000 a month or $16.60 per day per person. They are almost always under that regardless of continent. That’s less than most people spend in the U.S. who just stay put in one place. This surprises most people because, they think it’s expensive to travel. I think the main reason people believe travelling must be expensive is because their only point of reference is from taking expensive vacations. Vacations are only expensive because it involves staying in expensive hotels, eating out every night and paying top dollar for costly tourist and site seeing activities in a short amount of time. But that’s a post for another day. So how exactly do the Millers support themselves? You could say that losing all that money in the stock market crash was pivotal for them because it forced them to create a location independent income stream that they didn’t have before. In fact, Jenn and Tony said that they see that market crash as a blessing in disguise because it pushed them outside of their comfort zone and forced them to really evaluate what they wanted to do with their lives. 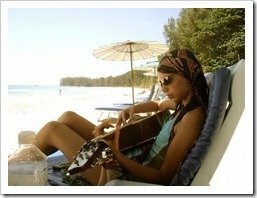 During their 3 month stay in Tunisia to regroup, Tony and Jenn decided to turn the skills they had acquired from their former professions into a portable income that they could earn from anywhere in the world. The majority of their income comes from Tony’s work as a Filemaker Database developer and designer. He has contracts with big companies you’ve heard of, and little ones you haven’t. He also creates iOS and Android Apps for small companies. Jennifer’s work converted nicely to travelling too. She is a teacher by training but has done educational consulting and curriculum design for the alternative schooling market for over a decade. Now she writes freelance for the home-school and travel markets, which really is great because it’s something she enjoys doing anyways but gets paid to do it. She also co-created an online class and workshop with another long term traveller; Nancy Vogel of FamilyOBikes.org. The course is called Dream: Reboot and it helps people define their dreams and then helps them turn those dreams into a reality. No surprise, the Millers have to travel light. No bags with wheels for the Miller’s. They each have their proper travelling backpack and a smaller day-pack for the buses, ferries, trains and planes. In their packs they each have three outfits, two swimsuits, a jacket and a rain coat. Computers for work and school. Toys for the kids, knitting for Jenn, a hand coffee grinder and press for Tony. OH, I almost forgot, Hannah, their now 16 year old daughter plays instruments. They carry a guitar, a mandolin and a fiddle for her and she plays for hours each day. It’s amazing I tell you. I want to meet this girl. Right the kids. I know a lot of you are thinking if it’s not the money then it’s the kids that are preventing you from living your travel dreams. Honestly, I believe this is just a mental block that we are brainwashed into believing. I mean, if you want to travel with the kids but feel like you can’t because it might hurt the kids future think again. As far as I’m concerned, it’s one of the best educations you can give your kids if you can do it. The Millers obviously feel the same way because their main goal in travelling was the KIDS EDUCATION and to introduce their kids to the world. They want to make the most of every second they have with their kids because according to Jenn, childhood evaporates at an alarming rate and they don’t want to miss it. They want to walk the world with their kids and create memories together that will change lives. Still not convinced? Here is what the Millers had to say about home-schooling on the road. “I think, if there’s one thing I’d like to say to parents who have the dream of traveling with their kids but are afraid to for some reason (education, socialization, relationship issues, whatever) it’s that they should step back from the fears and walk forward toward their dreams. I was raised travelling and building log cabins and eating turtle and porcupine and black bear as a tiny child. My parents took me out of school as a little kid and again as a teen to travel extensively and it is the BEST thing they could ever have done for me. Your kids will LOVE you for the experiences the world gives them and THANK YOU for being brave enough to swim against the tide. My teenagers love their life and already have the perspective to realize what a gift their uncommon childhood is. It’s hard when the whole world is doing “one thing” and your heart is pulling you in a totally different direction, but those dreams are inborn and unique and meant to be chased. Life is meant to be an epic Technicolor adventure, not a greyscale photocopy. When Will Their EdVenture (educational adventure) End? According to Jenn, they plan to travel full-time for at least another two years. After that, they plan on building a house in Canada on some property Jenn’s family has there. They even have their eye on a boat in Canada that the boys would like to spend some of their teen years sailing down into the Caribbean, perhaps. What Will They Do After Their Travelling Adventure Is Over? Jenn says that they may never work “real jobs” or live a “normal life nor do they have the desire to live the status-quo. I really love this attitude myself. I think living the status quo is perfectly fine if that is what you really want. But more often than not, we follow the status quo because that is what we think we MUST follow. Want To Slow Travel Around The World Like the Millers? I asked Jenn to give me her top tips for families who wanted to travel like they are and here is what she said. Stop making excuses for why you can’t do it, and DO IT. Don’t waste time, live your dreams. Create a location independent career, or income streams. Funding is the biggest on going challenge, once you get that sorted, it’s easy. The Miller’s are also very evangelical about encouraging other people to live their dreams and create a passion driven life for their families. They spend a lot of time helping people forward on their dreams for free. If you’re interesting in learning more about the Millers you can visit their blog www.EdventureProject.com. It really is a good read full of fascinating stories about their family and the lessons they learn on the road. Jenner wrote an ebook. 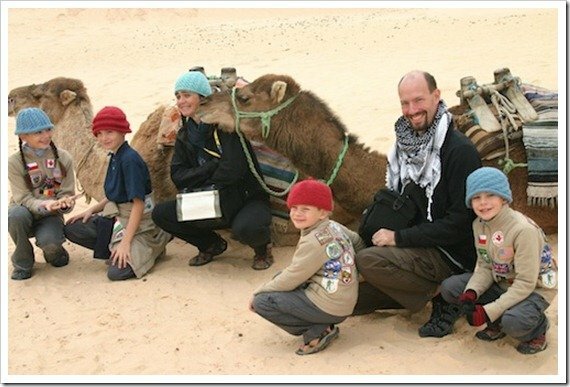 Bottles to Backpacks: The Gypsy Mama’s Guide to REAL Travel With Kids… with her friend Keri Wellman, in Germany and they are working on a second one that is in a totally different vein. Personally, I just love the Millers story because they are yet ANOTHER great example of what the human spirit can accomplish when you really put your mind to it. The Millers are my 8th family to be featured in an ongoing series showcasing and featuring families and couples who are travelling full time or for extended periods of time.